The right ski goggles are an essential part any successful ski trip. Goggles that fog up or have poor optics are an annoying safety hazard, and it is impossible to evaluate these qualities without lots of testing. So every year the ADS Sports Eyewear staff tests dozens of the most popular ski goggles. This is not just a way to write off our ski trips, we really do some serious testing. Ski Goggles that have the most potential are tested in a variety of lighting and weather conditions. Goggles that have the least potential are sent back to the manufacturer and taken off of our web site. This year we tested more than just goggles. We added several helmets and some sunglasses that are uniquely designed for snow sports. Reviews and insights from the goggles that made the biggest impression are listed below. Any recommendations we make are based on our experience, not the manufacturer's promotional material. Most of us wear prescription goggles, so that's what we will focus on here. We have tried all of the best ski goggles from Smith, Oakley, Bolle and Native. These are the reviews and opinions that we came back with. The Smith Phenom Turbo Fan scored extremely well in every category, again. The most impressive feature was the tiny 2-speed fan that clears up a fogged lens in just a few seconds. The Phenom also has a dual spherical lens that reduces distortion, and the Rose Copper lens tint that is the foundation for most of the Smith Ski Goggle lenses provided exceptional contrast. The venting is so well designed in the Phenom that it hardly ever fogged up, even with the fan off most of the time. When we came to a stop in the lift line or trying to read a trail map was when we really appreciated the ability to keep the lens clear. The Smith Prophecy Turbo Fan is another ski goggle that has exceptional anti-fogging characteristics. The Prophecy has the same universal fit as the Phenom, but is a slightly larger volume goggle. This means there is more air space behind the lens. Since it will take longer to heat up a larger volume of air, larger volume goggles will fog less. The Turbo fan makes this fact less of an issue, but if you tend to fog up a goggle faster than most people, this could be important. Nothing can wreck a great day on the slopes faster than a fogged up goggle, so we have a lot to say about these Turbo Goggles. But we were not quite as enamored with the 3rd Turbo option. The Smith Knowledge Turbo is an OTG goggle. (Over The Glasses) It is also HUGE. I would probably like this goggle a lot more if I was a lot taller. But I'm 5'10", and I wear a helmet most of the time. The goggle is so tall that the helmet presses it down on my nose. This goggle is designed provide plenty of room to wear prescription glasses inside the goggle. The Turbo fan does help minimize fogging, but the glasses are much closer to the heat of your face than a goggle insert would be. Therefore they are much more susceptible to fogging. And the flow of air created by the turbo fan is along the back of the lens. An insert would be in this column of air, but the fan is not as effective when regular glasses are closer to your face than to the goggle lens. So if fogging is a concern, we highly recommend the Smith Turbo Fan Series Ski Goggles for prescription skiers because of how easy the fans make it to clear fog out of the goggle. You don't need to leave the fan on at all times. It is only necessary when fog appears which is usually when you are at a standstill, on a lift, or breaking a sweat. Check out this video to learn a bit more about the Turbo Fans. 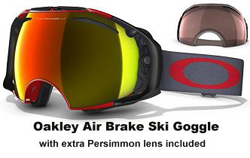 The Oakley Air Brake is our favorite Oakley Ski Goggle. This was not only comfortable and well vented, it also comes with two lenses. The second lens is always the Oakley Persimmon lens color that combines the light gathering effects of a yellow lens with the contrast of a light copper. This lens is great in low light conditions or even night skiing. The Oakley Air Brake is optimized to fit medium to large faces. Oakley crafted the durable yet lightweight frame with a rigid front and a flexible chassis, so the front eliminates pressure in the nasal area and maximizes airflow while the O Matter chassis adapts for a perfect fit. Strap outriggers ensure pressure is distributed evenly, and they are engineered to work with or without a helmet. This goggle has a triple layer of polar fleece foam that balances pressure and wicks away moisture. The Oakley Crowbar is an versatile fit goggle at a great price. The comfortable padding and excellent venting makes it a quick and easy choice for anyone with a small to medium sized face. The first Oakley ski goggle with struts to balance and distribute frame pressure for all-day comfort. The contact area is engineered to match facial contouring for a precise anatomical fit. Silicone backing keeps the strap in place. Triple-layer fleece face foam maintains comfort while wicking away the sweat of all-out sessions. The Smith Gambler Ski Goggle for kids is comfortable and functional. The same great lenses and cushioning is used in the kids goggles as in the adults. These cost between $25 and $40, making your kid's goggle choice easier than ever. The fit is best for kids 6+. The lenses block 100% of harmful light to protect those young eyes! Note: Any ski goggle lens will block 100% of UV light, we just want to reassure the parents here! Also, any Rx lenses made for a child's ski goggle are required to be shatterproof so we will never use CR-39 (plastic) lens material. The Oakley XS O-Frame Ski Goggle for kids is especially small fitting, making it great for kids as young as 4-8. They are available at a great price and are still very durable. There are not many color combinations but the lenses that are available are high contrast so that your child will have no problem seeing well. The lenses also block 100% of harmful light so you don't need to worry about your child's eyes. Note: Any ski goggle lens will block 100% of UV light, we just want to reassure the parents here! Also, any Rx lenses made for a child's ski goggle are required to be shatterproof so we will never use CR-39 (plastic) lens material. This is kind of a Good News / Bad News review. We loved the polarized lenses on these Native Ski Goggles. And all of these goggles come with a second lens for low-light conditions. They also have a unique Quick-Change lens system that was supposed to make changing the lenses really easy. And once you get used to it, it usually works pretty well. But getting used to it is a pain in the neck. So these Quick-Change goggles are no longer offered by Native. 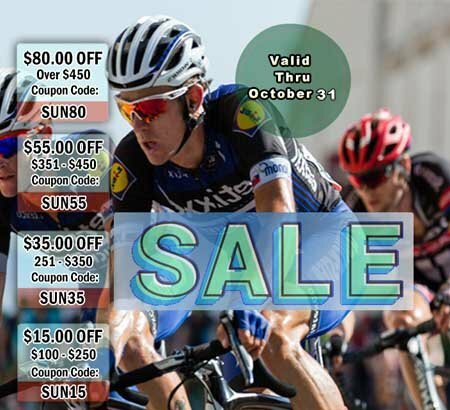 We have the prices seriously discounted from the original $189.00. But the good news part is not that it has an awesome polarized lens; a low-light lens; a heavily discounted price; and a pretty good Quick-Change lens system. The best part is that these Native goggles come with a Lifetime Warranty. So if (when) that Quick-Change lens system ever fails, you can swap these out for a much more expensive new version of the Native Goggles. The replacement goggles are not polarized, and they only come with 1 lens. But they're still pretty darn snappy. There are 2 versions of these Native Ski Goggles. The Native Mission Ski Goggle is a bit smaller, and generally preferred by women. The Native Siege Ski Goggle is a great goggle for men. Can I get prescription ski goggles without an insert? Prescription lenses are made from two individual lens blanks. A ski goggle shield is one-piece, so it is not possible to have a prescription in a ski goggle without using an insert. All prescription goggles with a 1-piece lens will utilize an insert behind the goggle lens. Years ago there was a company that made a ski goggle that looked more like a scuba goggle with individual right and left lenses. 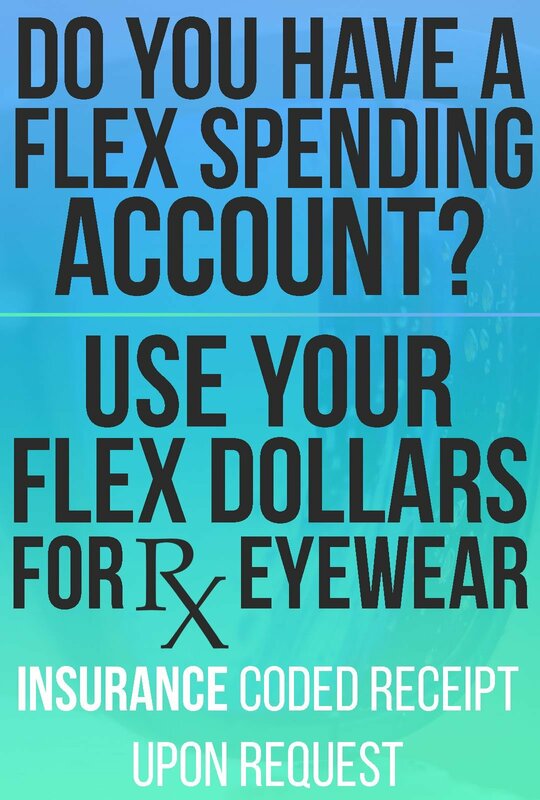 This design allowed the prescription to be directly in the goggle lens, but it also created a huge uncorrected spot right in the middle of your field of vision. This design has since been abandoned. We offer some Panoptx Ski Glasses that are like sunglasses with a removable foam eye seal. These have evolved from motorcycle sunglasses and have the prescription directly in the frame without using an insert. These are great for skiing in more mild conditions. But this smaller air space behind the lens will heat up faster, therefore the lenses can fog up faster. We prefer to ski with an insert. With Free-Form lens surfacing the optics are perfect; we have the ability to change the goggle lens when lighting conditions change; and with the insert away from the heat of your face and close to the venting for the lens this is the most fog-free option. And you can easily transplant your insert to another goggle if you ever want to upgrade or replace your goggle. Mirrored goggle lenses will hide the prescription insert better than a non-mirrored lenses. Should I wear prescription glasses under ski goggles? While there are ski goggles that are designed to be fitted over a pair of prescription eyeglasses (known as OTG or Over The Glasses goggles), it is still not an optimal choice. Regardless of the goggle's design, your glasses will still sit closer to the heat of your face than an insert, and glasses will not be in the natural venting of the goggle. This greatly increases the likelihood of fogging. We recommend our prescription insert that sits in the natural venting channel of the goggle. All ski goggles on our site sold as a prescription will use this insert as a default. The insert is easy to remove and install with the goggle for cleaning purposes. Why are my ski goggles fogging and how do I prevent this from happening? The basics of ski goggle fogging are pretty simple: If warm air hits a cold lens it is going to fog. Ski slopes are cold. Your face is warm. So the challenges here are obvious. These are a few ways to keep ski goggle fogging to a minimum. 1. Use a Smith Turbo Fan Ski Goggle. This is the absolute best anti-fog technology for ski goggles, especially for those with Rx lenses inside their goggle. While skiing the goggle venting will naturally move enough air through the goggle to keep it from fogging. The Smith Ski Helmets also have venting that draws air through the goggle. So these will increase air circulation, not suffocate it. If the goggle fogs up in a lift line or when you're stopped on the hill the fog can be cleared in just a few seconds by turning the fan on. 2. Seal the lens and keep it clean. If your lenses are clean and less porous fog cannot stick to them as easily. Our permanent anti-fog coating (+$59)is your best option. You will still need to keep the lens clean, but you should never put other anti-fog products on this permanent coating. This will just gum-up the surface and make the problem worse. We also offer an Anti-Fog Paste for $15.00. Apply the paste in the same way you would wax a car. Just rub it on the lens, let it sit for about 10 minutes, then buff it out with a lens cloth. 3. Do not use harsh cleaners on any part of the goggle. Finger prints or oily spots on your lens make it easier for fog to cling to the lens. Running water and a micro fiber cleaning cloth are the best way to clean these lenses as well as your prescription insert. DO NOT use any type of cleaning solution on your goggle lens. Just use water and blot it dry with a clean lens cloth. There is no need to scrub or rub either the goggle or insert lenses. Which lens color should I choose for my ski goggles? Snow is white and bright so seeing changes in the texture is difficult for the naked eye so choosing a base lens color that offers contrast is important. Contrast colors include brown, rose, copper, or orange. A grey base lens is not optimal unless it is for very bright conditions or for those that are light sensitive in general. The degree of darkness needed in a lens will depend on the weather conditions. Read our full ski goggle lens color guide for the brands we carry. What is a spherical goggle lens and how does it help me? 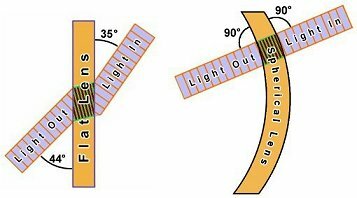 The spherical lens design has been around for several years, but many people are unaware of how important this is. The spherical (rounded) lens design allows light to pass in a straighter line though the lens material to your eye. A prescription lens alters the direction of light using an angled surface. When a ski goggle lens is not spherical, light at the top or bottom of the lens hits the lens at a much different angle than it does in the middle. This alters the true position of objects as they move from top to bottom in the lens.